I love the color. It matched my dress perfectly and looked classy. 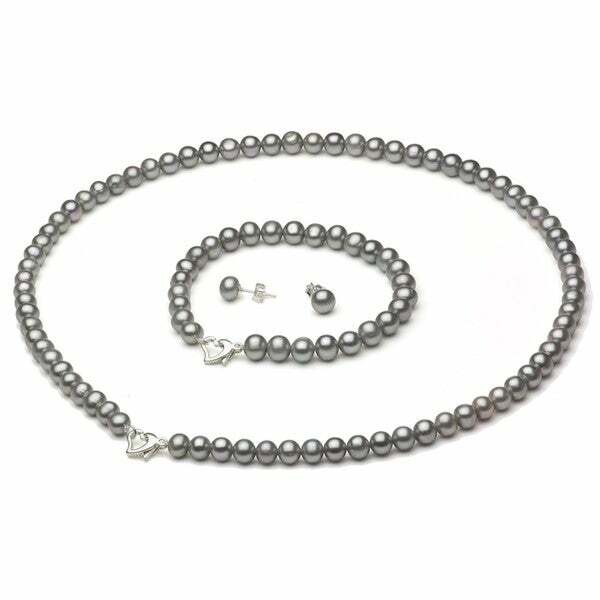 DaVonna Sterling silver Graduated 6-11mm Grey Freshwater Pearl 2-row Necklace, 17"
This jewelry set consists of an 18-inch grey freshwater pearl necklace, pearl stud earrings, 7-inch pearl bracelet and a beautiful white leatherette box. The necklace, bracelet and earrings secure with sterling silver clasps. All carat weights and measurements are approximate and may vary slightly from the listed dimensions. Treatment code D. See Gemstone Treatments for further information. This is the jewelry staple that I have been looking for. White pearls are not quite my style, but I wanted a simple, classic strand of grey or black pearls to wear regularly. It goes with just about everything. I wear it to work, out on weekends, it's just right for what I was looking for. I just wanted the necklace, but I bought the set because it was such an amazing deal. I will probably never wear the bracelet, but I LOVE the necklace, and I am more than getting my money's worth out of it! The pearls are lovely and nice to wear. The box is of good quality and construction. An nice added bonus. Well done. Pearls just right size to be called elegant. This my second set on pearls from overstock n they out did themselves again. Overall t product was great , which the grey was a like darker. But overall the product was good and meet the quality I was looking for. Great Job! Great price great product was well received by my niece. Pretty set, liked the color and the overall product. Found a similar product at another website for less money and same quality, so ended up returning these. "What is the difference between the silver and gray?"